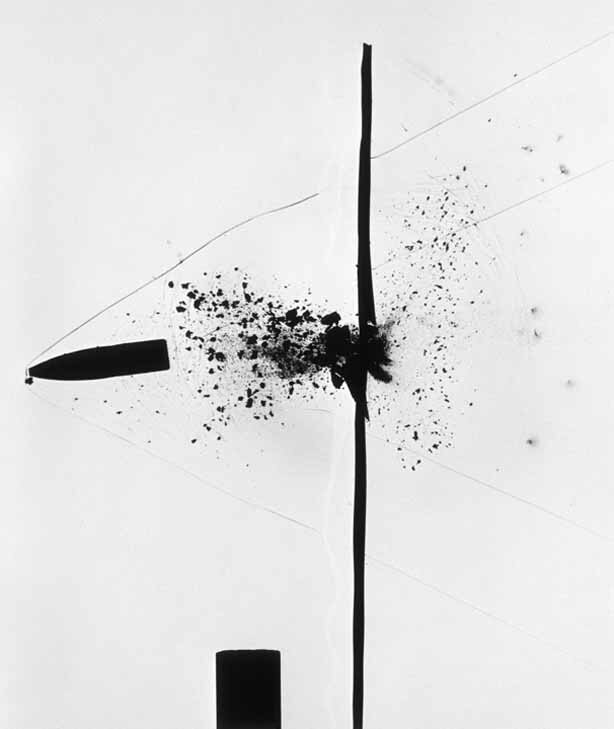 When a .30 caliber bullet pierces a thin sheet of plexiglass, the shock waves travelling through the plexiglass reach the microphone which, in turn, triggers the flash. This photo, taken in 1962, is actually a shadowgram, made without a camera or lens; the silhouetted exposure lasted less than one microsecond. The image was accomplished by placing a sheet of film in a film holder behind the one-eighth-inch thick plastic sheet and a Microflash in front of it. Careful examination reveals shock waves stirking the microphone at the bottom of the picture. The shock waves and hot gases from the bullet were made visible by the refraction of light around them. The irregular black spots to the right were caused by plexiglass shards puncturing the film. (see "Stopping Time" (1987), pp. 146-7).